This extravagant and wearable ring is of gilded (or gold-plated) silver. 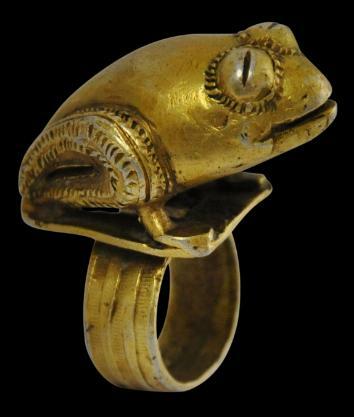 The bezel is in the shape of a crouching frog with large, languid eyes. The hoop is decorated with three bands of incised cross-hatching. Such rings were worn by local Akan or Ashanti (Asante) chiefs and were intended to both dazzle and convey a message to the beholder. Frogs are a universal symbol of fertility and prosperity on account of their being linked to the west season and rainfall. And so it is likely that this ring was intended to suggest a linkage to crop planting rites and prosperity. It is a fine piece of small sculpture. There is wear to the gold plating on the extremities as might be expected but otherwise is in fine, stable and wearable condition. Cole, H. M. & D. H. Ross, The Arts of Ghana, Regents of the University of California, 1977.